Automap is designed to make the task of assigning your hardware controls to various software parameters quick and easy. Despite having knobs and sliders, most MIDI controllers aren't particularly good at controlling plug-ins. It is difficult to assign the controls and you can't see what is controlling which part of your music software. Automatic plug-in mapping: All automatable VST, AU or Pro Tools format plug-ins need just be opened in any DAW for instant control. Heads-up transparent GUI: Automap provides a transparent control map across your computer screen, so you can see at a glance how every parameter is assigned. Learn and Clear modes: Make and delete assignments directly from your computer screen using lightning-fast click and touch facilities. Automatic Mixer control: A growing number of supported DAWs allow comprehensive control of the mixer via the Automap software (Non-supported DAWs can be controlled using separate dedicated Automap systems). Plug-in and Mixer map browsing facility: Get to the right software fast. 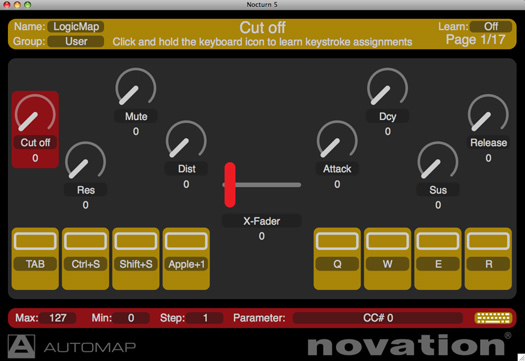 Control maps are automatically placed into categories depending on type (instrument, mixer etc.) for quick and easy browsing and selection with hardware or software. MIDI integration: 16 standard MIDI control maps (totaling 2048 separate controls) can be created to be used alongside plug-in and mixer maps - ideal for software with a MIDI learn facility. Pro Tools 11 is now detected on Mac and PC. AAX plugin control is not supported. Nuendo setup wizard no longer skips plugin wrapping. Impulse FW: Shift button not outputting 'off' message when depressed. Impulse FW: Won't output correct note off when keyboard is transposed up/down. BugFix for conflict with Launchpad MK2 and Launchpad Pro. Please note Automap has no native support for these devices. BugFix for missing Automap control surface in Nuendo. Bugfix for uninstaller crash on Mavericks (Mac). Now supports Sonar X2 & Sonar X3. Bugfix for Impulse fader jitter sensitivity issue, manifested by fader values flickering on some units. FBugfix for Impulse sending wrong note off message when a zone is transposed up or down. Fixed issue where preset could not be changed with speed dial on SL Mk II and SL Compact. Default Mapping load behavior with Nocturn. Updated Impulse firmware to version 670 which fixes issues with overlapping keyboard zones. Improved Nocturn Keyboard LED feedback of Logic's transport. Improved support for Reason on Impulse keyboards. Fixed Automap asking for password on launch when running in OSX. It will only ask once after installing. Fixed permissions with VST folders on OSX Lion by adding 'Installer Helper' after installation. Fixed Automap crashing Logic's AU 32 bit Bridge. Fixed missing screenshot for Logic and Remote SL setup guide. Improved Ableton Live setup procedures and guides for Nocturn, Nocturn Keyboard and Ultranova. Improved Ableton Live setup procedure and guides for Impulse. Removed plug-ins enabling for Impulse when using Ableton Live in setup wizard. Added notification message when trying to use an Automap 'thing' with Impulse when it is used under Ableton Live control surface. Fixed not being able to launch mapping editor by clicking status bar > edit mapping with Impulse and Ableton Live. Fixed crash when unplugging Impulse while using Ableton Live. Updated Impulse DAW Setup guides.